With a private golf course, 9 hole 27 par, pool and sauna for groups from 2 to 15. 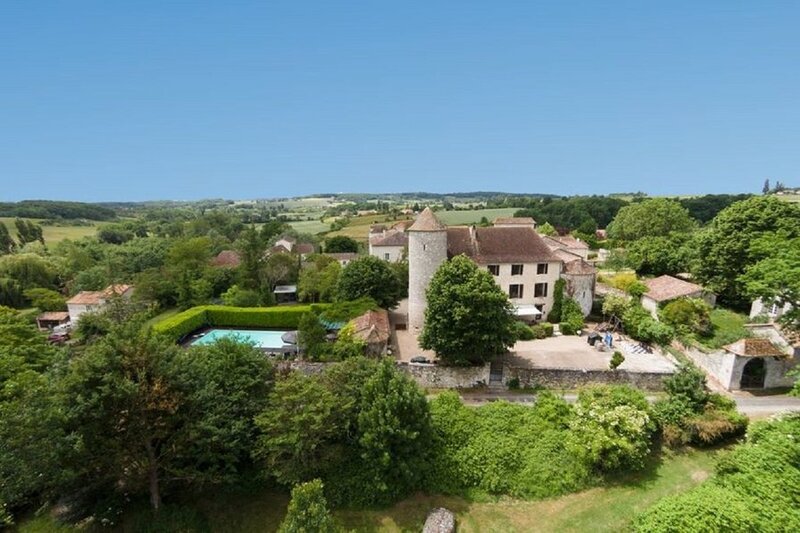 Château de Sadillac offers you an exclusive holiday accommodation for maximal 15 guests. Exclusive use of the facilities, like the golf course with its attractive 9 hole 27 par approach, pool with diving board, sauna, fishing lake for the kids, trampoline with safety net, huge chess game, children’s play corner, table football, table tennis etc etc. There are 6 luxury bedrooms, 3 en suites and 3 share one big bathroom, huge living room with wood burner, comfortable couch, television, dvd. Huge kitchen, fully equipped with an oven, gas cooker, combination microwave/oven, toaster, coffee machine, fridge, freezer, washing machine and dishwasher. There is a bar, with an extra fridge and entrance to the huge terrace with awning, overlooking the golf course. Through the bar you can also enter the spacious second sitting/dining area on the ground floor. On the terrace you can find a children’s play-corner, a life size chess, and the entrance to the pool complex, the terrace is surrounded by a medieval stone wall. In the pool complex you can find a South facing "heated" pool (12*6 meters) with a roman end and wooden decking, surrounded by a laurel hedge for privacy, a Finnish sauna, an extra toilet, shower and changing room. The main entrance is situated near the village square through this gate you will enter the garden, pool, sauna, parking, terraces and main entrance to the house, the garden is completely surrounded by an ancient wall and full of trees. The stone stair case leads you to the main entrance of the house into the hallway, the beautiful decorated living room with wood burner and bedroom number one. Golf equipment is free available for children and adults, also there are several high chairs and cots available. P.S price is based on 13 adult guests, kids ( max: 2 years ) stay for free, extra guests are 195€ p/p/p/w. in the neighbourhood are the Golf and Country Club Villeneuve (18 hole par 72, 9 hole par 31). Château Les Merles (9 hole par 36). The Dordogne and the Vézère rivers offer either tranquil, or exciting canoeing. There is a riding stable very close to us, near the Château de Bridoire and there are masses of roads and tracks to walk or bicycle on. Bergerac is our main town and is situated in the heart of the Périgord Dordogne region, on the west coast of France. The ancient city of Bergerac is compact in size and characterised by its elegant Renaissance buildings that sit alongside those dating from medieval times. Gourmet restaurants, street entertainment and the fact that almost all of the city can be seen on foot is part of its charm. Bergerac is renowned for its wine, and a short trip to the outskirts of the city reveals a landscape of vineyards that produce some of the world's finest vintages. The City of Bergerac is a modern little city that celebrates a long history. It centres on its old river port where rows of medieval half-timbered houses that lean over narrow alleyways, such as in Saint-Clar Street, vie for attention with the elegant 17th century houses in places like the Rue l'Ancien-Pont. Swans on the Dordogne river, parterres of lagerstroemia flowers dotted around its squares, including the city's largest square the Pélissière Place, and numerous little shops that draw the innocent visitor inside with ease add to its charm. A gentle walk around the city will reveal interesting museums, such as the Musée du Tabac and the Maison des Vins, tourist attractions like the statue of Cyrano de Bergerac, the hero of Edmond Rostand famous comedy, and plenty of street markets buzzing with activity. Then, of course, there are Bergerac's restaurants that come to life in the evenings. It is possible to enjoy the finest truffles or wild boar with one of Bergerac's world-famous wines, including its Monbazillac and Côtes de Bergerac. Eating out in Bergerac is not so much a special occasion as a necessity. It is renowned for its dedication to gastronomy. Numerous restaurants, cafés and crêperies serve everything from flavour some light meals to glorious presentations of several courses - and, of course, accompanied with some of the world's finest wines. Look out for touring, a local soup, truffles and foie gras. The area is known for its wild boar, partridge, hare, quail, duck, geese and trout, all of which will feature on almost all restaurant menus. Prices will start from around € 15 for a light meal. The bars in Bergerac are varied from cosy, atmospheric little venues with memorabilia of its wine-making history to the ultra modern styles that are now emerging. All tend to be lively. Bergerac does have a couple of nightclubs for those seeking a hectic night life, and one cinema, the Cinema le Cyrano, but most of its evening entertainment focuses around its restaurants. While Bergerac has lots of little speciality shops where locals and tourists alike can find designer fashions, china, glassware, jewellery and perfumes, the city revolves around its food and wines. At almost every turn, and on most days of the week, Bergerac hosts markets that are not so much a place to purchase the freshest of food or antiques but a social event at which to catch up with friends. The food markets are held on Wednesdays and Saturdays to around midday around the Notre-Dame church and Sainte-Catherine area, and the covered market is close-by.. Fresh fruit and vegetables along with cheeses, truffles and meats, vinaigrettes, herbs and, of course, local wine can all be purchased. The office Tourisme Bergerac in the Rue Neuve d'Argenson has a handy leaflet detailing all the markets, their times and venues. The chateau has several terraces, covered, shaded, in the garden, behind the chateau, near the pool. The pool has a childrens alarm, futher is the pool area complete surrounded by walls and a laurel hedge.